It's a lucky man who can make his living doing something he really loves. Gean Snow has his entire life. Upon returning home from the Korean War, Gean got a job selling in a sporting goods store. Later, he started his own ANGLER's INN, selling only fishing tackle. He has helped thousands get started in the sport he dearly loves. Teaching KIDS how to FISH gives him as much pleasure as catching a 1,000 pound marlin!-- and he has caught everything from bluegills to black marlin. Thousands are the number of kids he's helped get started. Watching Gean and seeing how much he loves to teach kids how to fish, inspired me to suggest this project to him. He and I have been good friends and fishing companions for over 30 years. We have fished together from Alaska to Argentina (and about every good spot in between.) Years ago, we set a goal for ourselves to catch 100 species of fish before we die. Gean made it; I still have seven to go. I was always filming first; I had a weekly TV fishing show I had to get film in-the-can for before I could start fishing. I was always happy to have Gean along, knowing that he could always produce some fish for me to film. Here are 42 short videos, which now ---thanks to the Internet---we can share with thousands of kids worldwide. 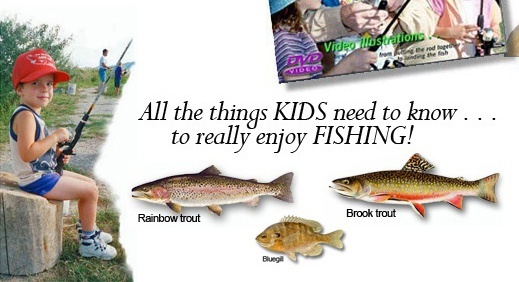 Hopefully, this will inspire kids to take up this great sport...and parents to watch the videos together with their kids, and then, spend some time with them in our great outdoors. Enjoy the videos. Follow up note: Before I was able to finish building this web site, my friend passed away. It was a very sad day for me. I want to dedicate this web site to Gean Snow. Let it be not only a tribute to him, but a way for him to go on indefinitely -- doing something he loved so much -- teaching kids how to fish. Hopefully, thousands of kids will find their way here and come to enjoy what Gean so lovingly taught and so generously shared his entire life. Nothing pleased Gean more than watching a young boy or girl catch their first fish!